Why do I get WI Reject F1-002 when I made an extension web payment? 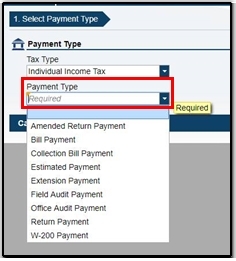 When making an extension payment through the Wisconsin Department of Revenue website, the correct tax type and payment type must be selected. If making an extension payment, “Extension Payment” or “Estimated Payment” must be selected. If any other payment type is selected, the return will receive Reject F1-002, “Our records indicate you have claimed more estimated payments than are in your account. The return will either have to be paper filed, or e-filed without the extension payment. In this case, the Wisconsin Department of Revenue will match the payments to their records and adjust the amount due or refund on the return, but it will require additional processing time. For more information about making payments through the WI DOR website, see the DOR's Tax Account Personal FAQs. Article has been viewed 990 times.